In a flash, Dustin Shillcox’s life was changed forever. Dustin was in a car accident and was paralyzed from the chest down. Doctors told him that her would never walk or be able to move his legs again. Dustin lived with this diagnosis until 2013 when he received an electrical stimulation implant. After doing 18 months of therapy with little results, Dustin was lucky to get accepted into research that was studying electrical stimulation implants. He had to go to a lab 5 days a week for 2 1/2 years and became 1 of 4 people in the world to receive this technology. Now Dustin can stand, move his legs, toes, ankles and his overall health has improved. Dustin created the Dustin Shillcox Foundation to help advocate for others in his situation. The foundation raises money for spinal cord research and is determined to improve the live’s of others in wheelchairs. Dustin’s passion is heard in his motivational speaking engagements where he focuses on the power of a positive attitude and never give up attitude. 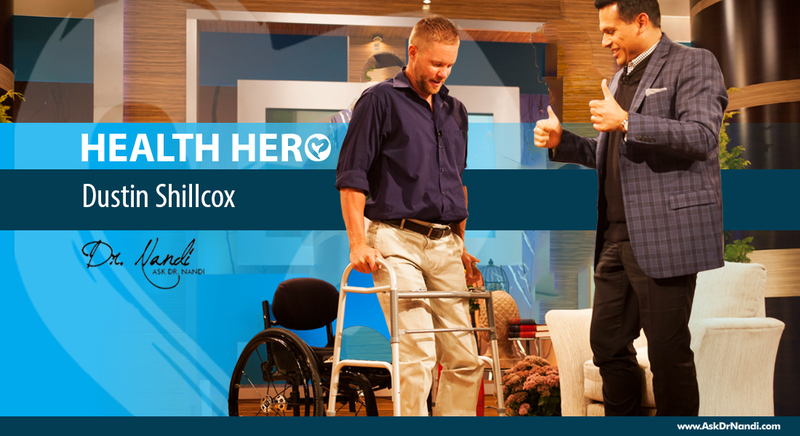 Because of this, Dustin Shillcox is this week’s Health Hero! Learn more about Dustin on her website DustinShillcox.com.